This is a modern day western with the wide open Texas plains, the dry dusty roads, the sleepy little towns with its share of colorful denizens. 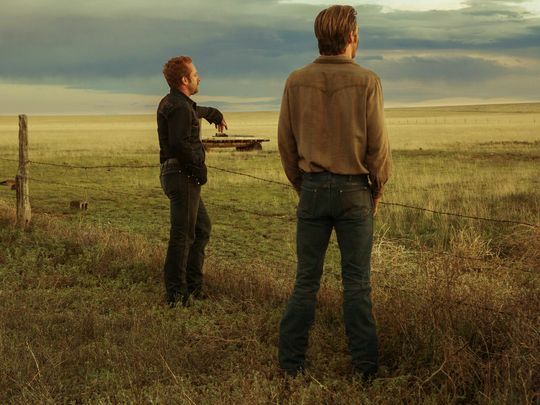 Directed by David Mackenzie and smartly written by Taylor Sheridan it touches on the poverty stricken West Texas where banks are foreclosing on farms, jobs are hard to find and homes are in disrepair and everyone carries a gun. It may have been filmed in Eastern New Mexico, but it’s still the dry inhospitable high desert and the tough people that have to live there. Tanner (Ben Foster) who just got out of jail after serving eight years for the manslaughter of his abusive father, comes back to the homestead where his brother Toby (Chris Pine) had been caring for their dying mother. The bank is due to foreclose on their ranch, so the brothers make a series of early morning robberies only taking the drawer cash, no big bills, and nothing to get the FBI involved. So it falls to Texas Ranger Marcus Hamilton (Jeff Bridges) who is due to retire in a couple of weeks. Bridges really dives into the crotchety old lawman who good naturedly verbally insults his partner Alberto (Gil Birmingham) on his Native American/Mexican heritage. When the brother’s pull off two robberies in a row, it gets Hamilton’s blood hound tenacity fired up. The cat and mouse crime caper is typical of the genre, but there’s a twist. The guys are targeting the banks that holds the lien on the farm. With the money they take, they launder the cash at the Oklahoma casinos to pay the bank the money owed. Toby is doing it for this two boys who live with their mom and are pretty much estranged from their dad. Hamilton and Alberto of course don’t know this as they try and figure out where the next bank will be targeted. Pine shows the world that he can play a totally different kind of character than the usual good looking hero. Ben Foster is totally immersed as the out of the control brother who is deeply protective his family. And of course Jeff Bridges never fails to dominate the screen as the old codger who can still shoot a sniper rifle as well as think through the maze of a crime. The scene between Pine and Bridges just crackles with quiet threat. There is some humor in the script, but it’s also a very violent story that is grounded by the social awareness of our world and of people living on the edge. It’s a film that may not get the young crowds at the metroplex, but it’s one of those movies that is absolutely worth the price and the time.